Every time you buy equipment, a user's manual is usually part of the package. The user's manual is more than just a step by step guide on how to operate the equipment but is also contains several safety guidelines that are compiled to help you operate the machine safely and free from accidents. Unfortunately, most owners are too busy reading the instructions they barely notice the safety guidelines found in the first few pages of the user's manual. As a result, they find themselves hurt or exposed to toxic fumes. Like many other devices, a user's manual is also part of the package for a gas powered water pump. Unlike hand pumps or electric pumps that use either human power or electricity, a gas powered pump uses gas. Gasoline is fed through the tank and this will then be converted into energy that will power up the pump. Without gas or gasoline, the water pump is useless. However, since gasoline is a combustible fluid, a user's manual for a gas-powered pump usually comes with a number of safety guidelines that you, as the owner, should read carefully. First, you must be familiar with the equipment. This is the main purpose of your user's manual. To help you familiarize yourself with the machine. 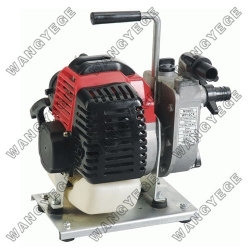 Do not just go operating the water pump without reading the manual. In addition to that, take note where the power switch is, where the emergency switch is, and how to turn the machine on and off. Understanding how the pump controls and switches may help prevent accidents. Second, a water pump is designed to pump water only thus you should not attempt pumping gasoline or any other flammable liquids. Third, do not let children operate the pump. Fourth, the exhaust may contain a poisonous gas called Carbon Monoxide. Inhalation of this gas can be life threatening, therefore, it is important that you maintain adequate ventilation when using a gas powered water pump. There are still more safety guidelines included in your user's manual. Take time to read it and prevent accidents from happening.